Clay baker --what size loaf? I have the oblong Breadtopia clay baker . Baked sourdough once & it was great. How large of loaf by weight can you put into the oblong ( ~14" x 9")?? Bolted sprouted sourdough bread, baked in an oblong cloche, may be the perfect loaf to bring to a dinner party or just to enjoy at home. 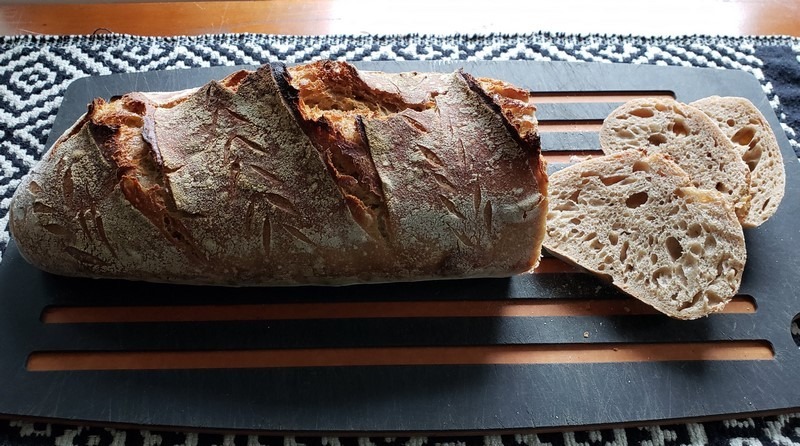 I actually have been searching for the answer to that question too, I have the Clay Baker - Batard from Breadtopia and I was wondering how big of a loaf I could get in there, does anybody know? I would aim for at (or under) 500g bread flour or 600g whole grain flour. Maybe up to 1300g total dough weight, depending on your ingredients? A thirsty whole grain loaf at 100% hydration with starter and salt could be 1300g. An explosive bread flour loaf could fill the baker at 1000g. I was wondering how big of a loaf I could get in there, does anybody know? I regularly do whole grain (lean dough) loaves in that baker where I’m using 600 grams of whole grain flour and there seems to me to be ample room for more. I’d be surprised if there was a problem with doing a 750g loaf, but in my case I think the limiting factor would be my proofing basket. I have the standard rattan oval basket that Breadtopia sells and the resulting proofy dough with 600g of flour is right about what it can hold.